The Saugus Airport, later known as the Newhall Airport, was an intermediate field along the airway  "intermediate" meaning it wasn't a scheduled airline stop, rather an airport used if an airliner needed to divert from a planned destination. For instance, fog in the San Fernando Valley might require a landing farther north at a slightly higher elevation that wasn't shrouded in fog  such as Saugus. At first, U.S. airways were lighted; that is, beacons on top of towers were used for airliners of the 1920s and 1930s to navigate at night  but not in bad weather. Saugus was beacon 3A along the lighted airway from Los Angeles to San Francisco. Its runway was 2,470 feet long, 600 feet wide. The 1930 diagram shows its approximate position relative to San Fernando Road (aka Railroad Avenue/Bouquet Canyon Road). Sometime in the 1930s, four-course radio beacons were set up for aircraft navigation. This was a leap ahead of the light beacons and lighted airways, as these radio ranges were all-weather. A radio beacon was established and identified as the "Newhall" beacon, operating on 209 KHz, with the Morse code identifier of NH. These early radio beacons were limited to four courses. The Newhall beacon was initially part of the Amber 1 airway; later it also was part of the Green 4 airway. A 1943 map shows the airfield named "Newhall" (not Saugus) at an elevation of 1190 feet above sea level. A 1946 aeronautical chart shows the airport as Newhall, elevation of 1207 feet, with a 4,000-foot-long runway. It still has the 3A lighted airway beacon, 4-course radio beacon 209 KHz, identifier NH. A 1951 aeronautical chart shows the airport as Newhall, elevation of 1207 feet, with a 4,000-foot-long runway. The lighted beacon is no longer shown; the radio beacon is 209 KHz, new identifier EHA, 4 courses. 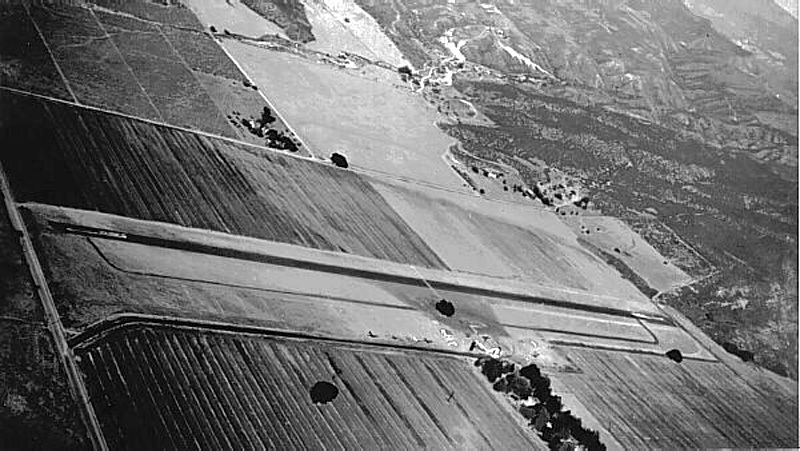 Also in 1951, a new airport is shown: the 6-S Ranch, elevation 1350 feet, with a 2,600-foot-long runway, located about where Whites Canyon Road in Canyon Country is today. A 1960 aeronautical chart no longer shows Saugus or Newhall having an airport. The radio beacon 4-course range at 209 KHz, identifier EHA, now makes up the southwest end of Green 4 airway. The 6-S Ranch airport is still shown, elevation 1349 feet, runway 2,500 feet long. A 1962 aeronautical chart no longer shows any airport in the Saugus/Newhall/Canyon Country area. (Established in 1946, the 6-S Ranch Air Park closed in 1960, upon the death of its owner. It became the North Oaks housing tract.) In 1962 the radio beacon 4-course range was still operational on 209 KHz, identifier EHA. While in 1962 many 4-course radio ranges still existed, the "colored" airways were no longer shown. Most airways switched to the "Victor" airways using VHF omni-directional (360-course) radio navigation stations. After this time, aeronautical facilities in the Santa Clarita Valley no longer existed.